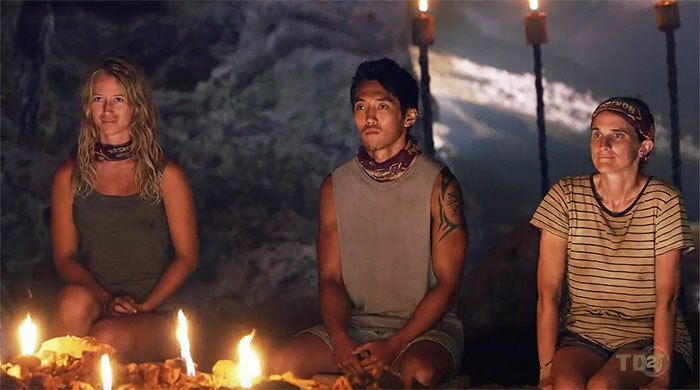 SurvivorNZ: Thailand (2018) - Winner, 4-3-0. Received four jury votes to win (4-3-0), in Episode 15 (Day 39). NZ: Thailand Ep. 1 RC: With Tara, loses the first point vs. Jose and Renee, but Khang Khaw wins, 3-1. NZ: Thailand Ep. 1 IC: Works the puzzle with Dylan, and Khang Khaw wins again. NZ: Thailand Ep. 2 RC: "Smash & Grab" - Sits out, as Khang Khaw wins some melons. NZ: Thailand Ep. 2 IC: "Shoulder the Load" - Outlasts the entire Chani tribe while holding 70 kg; Khang Khaw wins, 3-0. NZ: Thailand Ep. 3 RC: "Idol Hands" - Loses twice to Franky, and Khang Khaw loses, 10-3. NZ: Thailand Ep. 3 IC: "Deep In Thought" - Helps work the puzzle, as Khang Khaw wins big. NZ: Thailand Ep. 4 RC: "Sumo at Sea" - Sits out, as Khang Khaw wins. NZ: Thailand Ep. 4 IC: (Chains, bolos) - Chained, gathers bags, as Khang Khaw throws the challenge, loses. NZ: Thailand Ep. 5 RC: "Dizness as Usual" - Now with New Khang Khaw, helps move the boards, Khang Khaw wins! NZ: Thailand Ep. 5 IC: "Buoy oh Buoy" - Retrieves a fish trap with Liam, but Khang Khaw loses. NZ: Thailand Ep. 6 RC: (Bridge & slide puzzles) - Works the puzzles with JT, Khang Khaw loses again. NZ: Thailand Ep. 6 IC: "Discy Business" - Original Chanis throw the challenge; Khang Khaw "wins". NZ: Thailand Ep. 7 RC: "Kicking and Screaming" - Chani forfeits/concedes, so Khang Khaw wins chickens. NZ: Thailand Ep. 7 IC: (Obstacles, math puzzle) - Sick, but helps carry and work the math puzzle; Khang Khaw wins. NZ: Thailand Ep. 8 RC: "Coco Connection" - Lisa hits on two shots, and Khang Khaw wins! NZ: Thailand Ep. 10 RC: "Challenge Pitch" - Works the puzzle for her team, and the yellow team wins! NZ: Thailand Ep. 1 Ind. RC: Eliminated in the first round (tie-11th/18). NZ: Thailand Ep. 8 IC: "House of Cards" - Challenges for the lead at several points, does not win (tie-2nd/10). NZ: Thailand Ep. 9 RC: "5x5" - Lands a bag in one of the five squares (tie-7th/9). NZ: Thailand Ep. 9 IC: "This Much" - Lasts 30 minutes, third to drop out (7th/9). NZ: Thailand Ep. 10 IC: "Paddle Out" - One of four people to end up with zero balls placed (tie-5th/8). NZ: Thailand Ep. 11 RC: "Over Extended" - First person out, on the transition to six pieces (7th/7). NZ: Thailand Ep. 11 IC: "Rope-A-Dope" - Makes the second round, but falls off the balance beam (5th/7). NZ: Thailand Ep. 12 IC: "Offer It Up" - Makes it to the 12th item stacked, but drops (5th/6). NZ: Thailand Ep. 13 RC: "Domino Effect" - Eliminated in the first round, not close (tie-4th/5). NZ: Thailand Ep. 13 IC: "Get A Grip" - Third to drop out, within a minute or so (3rd/5). NZ: Thailand Ep. 14 RC: "One Track Mind" - One of three working on the maze puzzle when Dave wins (tie-2nd/4). NZ: Thailand Ep. 14 IC: "Vampire Bats" - First to drop out, around 12 minutes in (4th/4). NZ: Thailand, Ep. 7: Wins against Dave in a word scramble; wins the vote-steal advantage (1st/2). NZ: Thailand, Ep. 7: Wins the vote steal advantage, but it's active only at Lisa's next Tribal (Day 20). NZ: Thailand, Ep. 8: Plays her advantage, stealing Arun's vote and voting twice—correctly—against him (Day 24). NZ: Thailand, Ep. 11: Sees the idol at the same time as Matt, but he grabs it, Lisa doesn't (Day 30). NZ: Thailand, Ep. 5: Liam Hose (voted out, 4-3). NZ: Thailand, Ep. 8: Arun Bola, Arun Bola (voted out, 5-3-2). NZ: Thailand, Ep. 9: Brad Norris (voted out, 5-3-1). NZ: Thailand, Ep. 10: Renee Clarke (voted out, 5-3). NZ: Thailand, Ep. 11: Eve Clarke (voted out, 6-1). NZ: Thailand, Ep. 12: Matt Hancock (voted out, 3-2-1). NZ: Thailand, Ep. 13: Adam O'Brien (voted out, 3-2). NZ: Thailand, Ep. 14: Tara Thorowgood (voted out, 2-1-1). *Lisa used her vote steal in Ep8, then voted twice for Arun, who was booted: Two VFB, two TCA. NZ: Thailand, Ep. 8: Two votes, from Dave and Eve. NZ: Thailand, Ep. 13: Two votes, from Adam and Tess. NZ: Thailand, Ep. 14: One votes, from Tara. NZ: Thailand, Ep. 15: Received four jury votes, from Arun Bola, Eve Clarke, Matt Hancock, and Tara Thorowgood, to win, 4-3-0. Khang Khaw wins! Lisa grabs the idol! Ticked that off my bucket list! Cheers to the new tribe! He's never really talked strategy with me before?! Chani wants to concede? Okay! Not going well. Thanks, JT! This is a big move! Everyone loves Matt. This is the time to take him out. Who needs a reward when you have rice? The blindside plan is ruined! Stuff.co.nz (4/11/18): "Survivor NZ contestant Lisa Stanger's 'nerdish-ness' is her path to victory"
ZM Online (4/12/18): "Meet the Survivor contestants: Lisa, Adam and Matt!" NZ Herald (7/30/18): "Survivor NZ winner Lisa Stanger's secret weapon"
Kate Robertson at Stuff.co.nz (7/30/18): "Years of Survivor research couldn't prepare Lisa Stanger for world's toughest game"
Kyle Dessent & Bryan at 2 Boys Talk Survivor (7/29/18): "NZ: Thailand E15 Winner Interview"
Shannon Gaitz at RHAP (8/5/18): "Thailand Deep Dives | Lisa Stanger"
"Lisa is hoping that her huge love of board games (which includes a weekly game night at her house) will come in handy when it comes to the puzzle challenges. 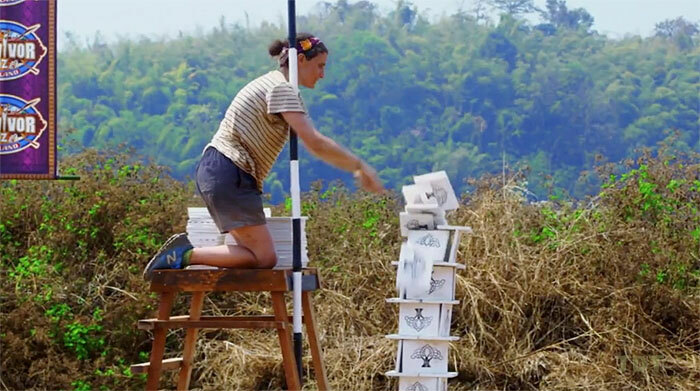 Described by friends as smart and organised, Lisa plans on playing a long strategic game on Survivor New Zealand to get her the title of Sole Survivor. Having never been further afield than Australia, this trip to Thailand will bring a brutal new environment that Lisa has never experienced before. What did you do to prepare for Survivor? Got the fittest I’ve ever been (don’t get your hopes up), camped out overnight, researched, researched and researched! What makes you the ideal teammate? I am good at puzzles, know a heap about Survivor and try to be respectful of others space and needs. Thoughts on Alliance or Immunity Idol? The Survivor fan in me wants there to be all sorts of shifting alliances, advantages, twists and Immunity Idols. The person, who wants to win, wants the most simple a game as possible to cut down on variables. We’ll see which one we get. I think I will be delighted either way because I am playing Survivor! What’s your strategy on the island? Be as honest as possible until the perfect time to be dishonest arises, and putting myself in a position with people who will want to stick with me until the end. "